-- Apr. 1, 2019. Loic, our Eramus exchange master student from University of Lyon 1 has started his 4 month trainig stay with us. Enjoy the FunPolCar group! -- Mar. 15, 2019. 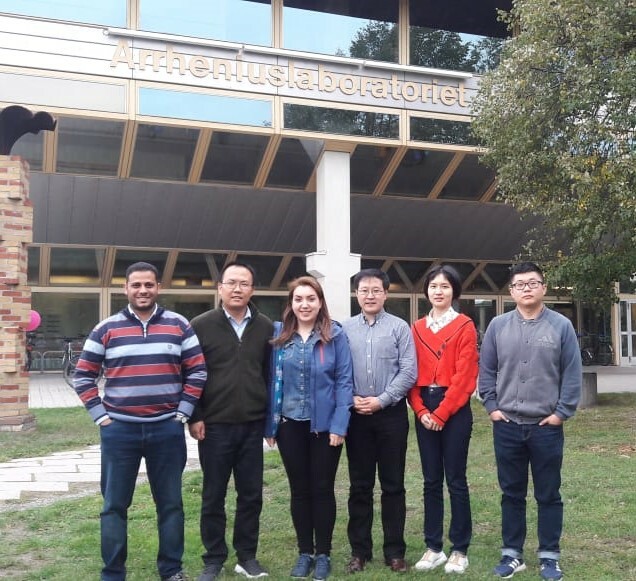 Our joint application with Prof. Liangti Qu from Tsinghua University, China has been approved by STINT (The Swedish Foundation for international Cooperation in Research and Higher Education) and NSFC (The National Natural Science Foundation of China). -- Dec. 1, 2019. Porous carbon membranes in collaboration with Hong go into seawater desalination! ACS Nano,2018, DOI: 10.1021/acsnano.8b07526. -- Nov. 15, 2018. Our VR preject on Ionic complex structures of 2D nanomaterials has been approved! -- Sep. 21, 2018. Group photo in front of the Arrhenius Laboratory at Stockholm University in September 2018! -- Sep. 1, 2018. Our review article "Porous polyelectrolytes: charge pores for more functionalities in Angew. Chem. Int. Ed." DOI:10.1002/anie.201710272 goes online, a back cover page! Comment: The past decade has witnessed rapid advances in porous polyelectrolytes and there is tremendous ongoing interest in their synthesis and applications in environment, energy, biomedicine and catalysis. 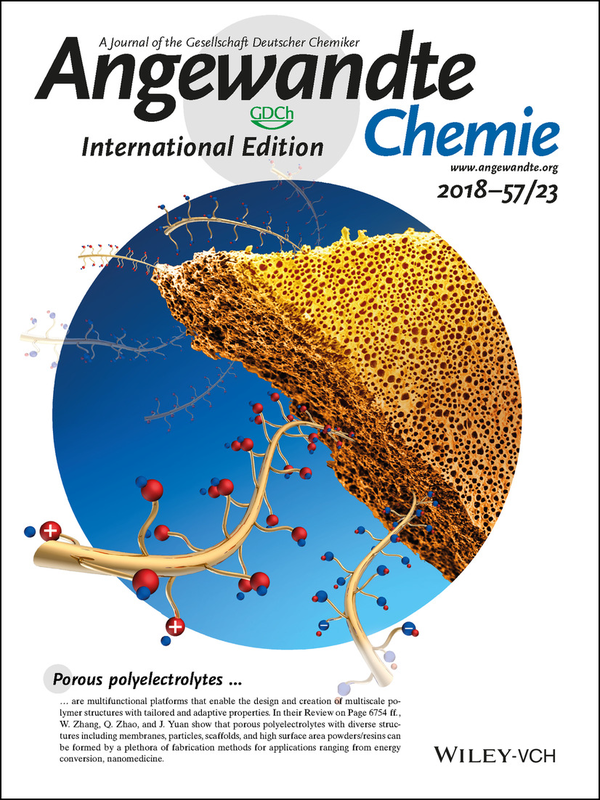 The porous polyelectrolytes research is motivated by the synergy of, apart from the flexible choice of functional organic groups and processing technologies, the charge and pores spanning length scales from individual polyelectrolyte backbones to their nano/micro superstructures. This review surveys recent progresses on porous polyelectrolytes including membranes, particles, scaffolds, high surface area powders/resins, and their derivatives. Our focus is the interplay between surface chemistry, Columbic interaction and poreconfinement that defines new chemistry and physics in such materials for implications including energy conversion, molecular separation, water purification, sensing/actuation, catalysis, tissue engineering, and nanomedicine. -- Aug. 22, 2018. 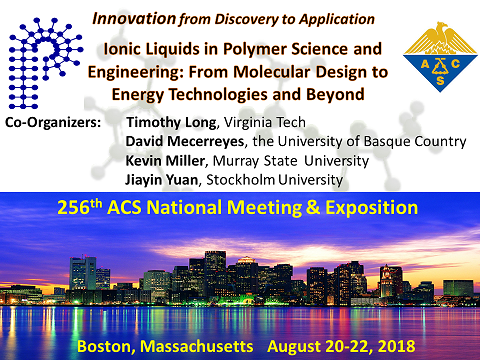 The second IL-in-Polymer Symposium Ionic Liquids in Polymer Science and Engineering: From Molecular Design to Energy Technologies and Beyond has been successfully completed. Great talks, deep discussions, and follow-up review proposal! we hope to continue this symposium in the future 2-3 years! -- Aug. 16, 2018. After a 8 month delay, Dr. Weiyi Zhang re-joins our group as a postdoc, welcome on board! -- Aug. 1, 2018. Our porous poly(ionic liquid) membrane actuator can "read" chemical reactions! (Nat. Commun. 2018, 9, 1717. DOI: 10.1038/s41467-018-03938-x. -- Jul. 31, 2018. Jian-ke's article titled 'General Synthetic Route toward Highly Dispersed Metal Clusters Enabled by Poly(ionic liquid)s' has been featured in 2018 JACS Young Investigators Virtual Issue: ttps://pubs.acs.org/page/jacsat/vi/young-investigator2018.html. Good job again! "JACS Young Investigators Virtual Issue - - We are excited and pleased to provide an ACS Select virtual issue based upon the outstanding work of young investigators published in 2017 in the Journal of the American Chemical Society. This collection of Articles and Communications highlights premier research in diverse topical areas from around the world that is of broad interest to the contemporary readership of JACS. These carefully selected publications were chosen by the appropriate, knowledgeable JACS Editors on the basis of reviewer input and editorial evaluation. - - Peter J. Stang, Editor-in-Chief." -- Jul. 16, 2018. 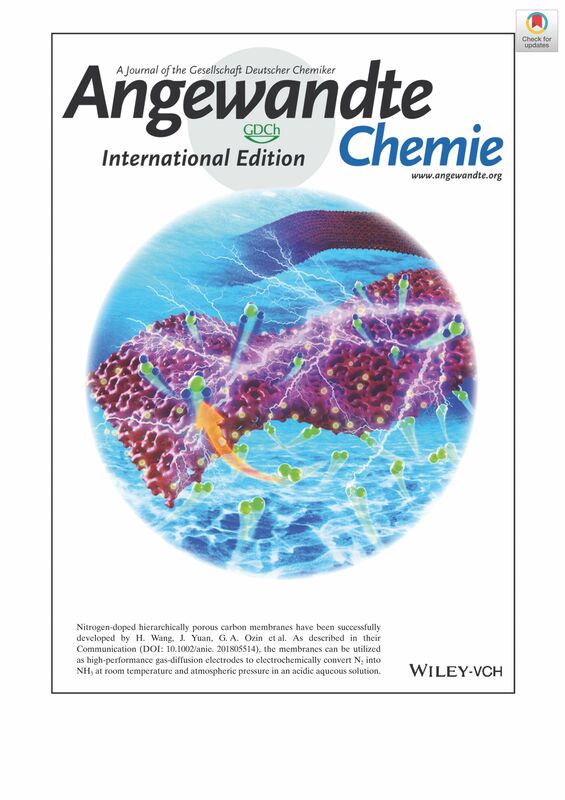 Jian-ke's article entitled 'Three Birds, One Stone: Photo-/Piezo-/Chemochromism in One Conjugated Nanoporous Ionic Organic Network' was selected as a Hot Article 2018 and as such it has been included in the Hot Article 2018 web collection for Journal of Materials Chemistry C.And ew made the Front Cover! Good job! DOI:10.1039/C8TC01324A. -- Jul. 20, 2018. 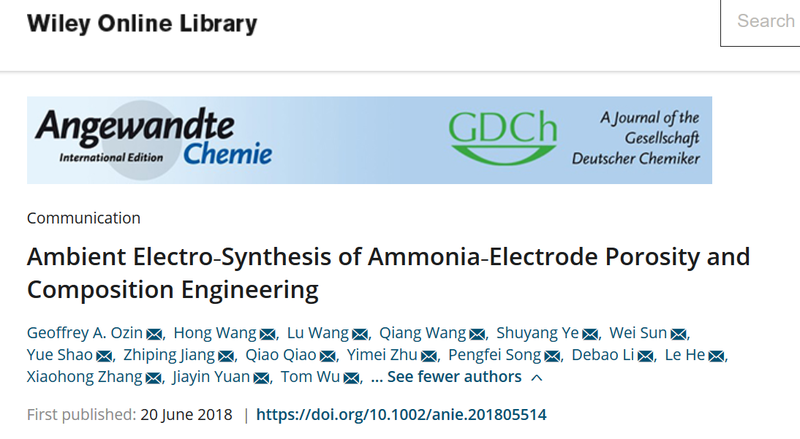 Our joint publciation with Hong and Geoff "Ambient Electro-Synthesis of Ammonia-Electrode Porosity and Composition Engineering" 10.1002/anie.201805514 is online, and we made the Cover Page in Angew. Chem. Int. Ed. ! -- Jul. 1, 2018. After a 6-month transition from Clarkson University to Stockholm University, the new group is now ready to go. -- Dec. 15, 2017. The PI, Jiayin Yuan, has been invited to become a member of the International Advisory Boards of Macromolecular Rapid Communications and of Macromolecular Chemistry and Physics from Wiley-VCH. -- Dec. 12, 2017. 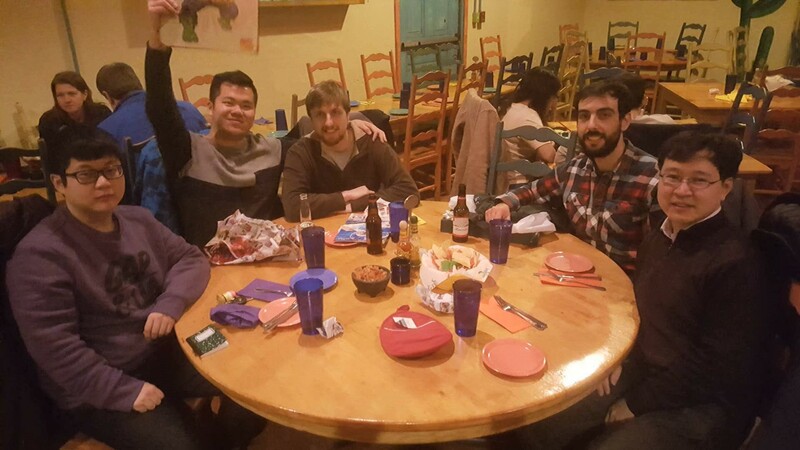 Group dinner in Cactus Grill & Cantina to celebrate the success of David's 2-month stay with us. Good journey, David! -- Oct. 11, 2017. 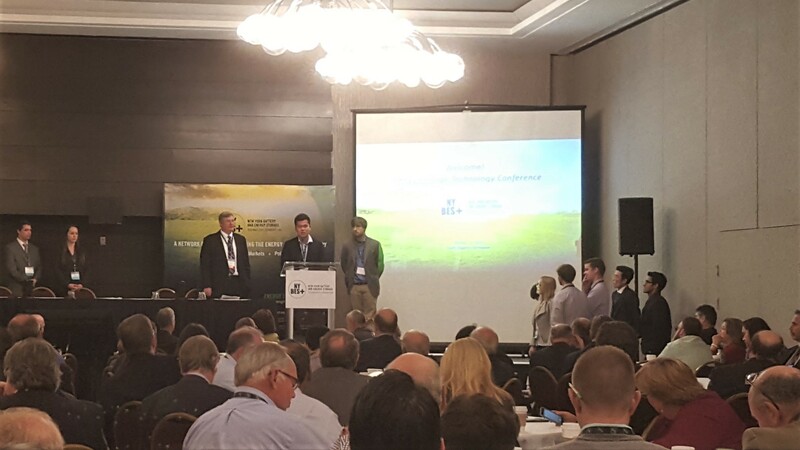 Yongneng, MIke and Jiayin joined the New York-BEST Energy Storage Technology Conference in Rochester. YOngneng and MIke did a poster and Jiayin delivered a talk there. -- Oct. 6, 2017. Mr. David Patinha from University of Lisbon joins us for 2 months as an Exchange PhD student. Welcome David! -- Aug. 15, 2017. Dr. Weiyi Zhang joins us as a postdoctoral researcher. Welcome Weiyi! -- June 7, 2017. A manuscript has been accepted in J. Am. Chem. Soc. 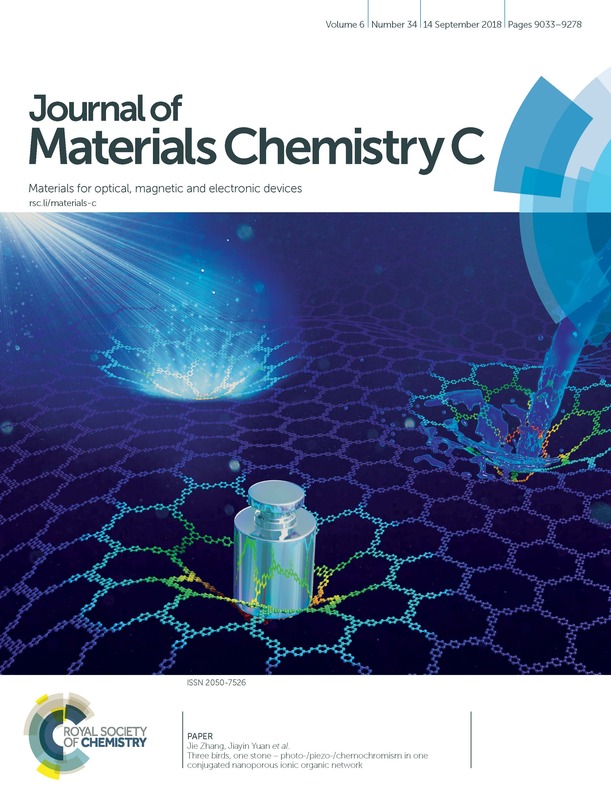 "General Synthetic Route toward Highly Dispersed Metal Clusters Enabled by Poly(ionic liquid)s" by Jian-Ke Sun, Zdravko Kochovski, Wei-Yi Zhang, Holm Kirmse, Yan Lu, Markus Antonietti, and Jiayin Yuan*. (Good job again, Jian-ke!) 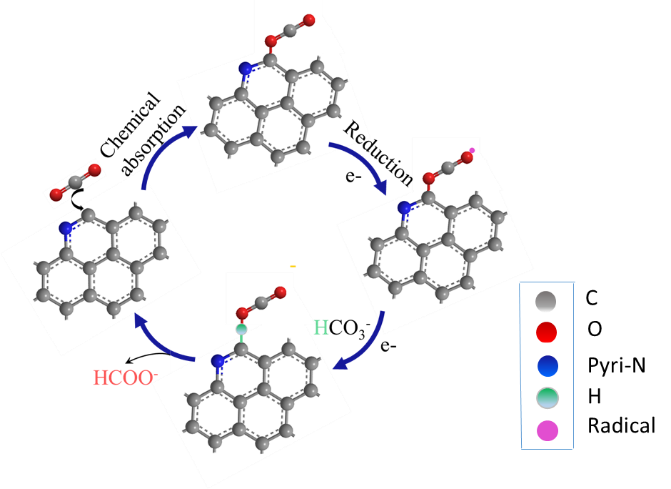 DOI: 10.1021/jacs.7b03357. Comment: Triazolium ionic liuqids are precursors of carbenes that are easily prepared in a mild environment, for example, the usage of even a weak base (imidazolium ionic liquids need a strong base for carbene formation). This work combine the propperty oof triazolium ionic liquids with polymers, which provides a new polymer stabilizer. PILs are already known stabilizers. But to control the size of metal nanoparticles approaching to cluster level, the formation of polycarbene seems to be necessary. The core value is, the polycarbene-metal complex formation and the metal cluster formation are completed in one step. -- May 20, 2017. 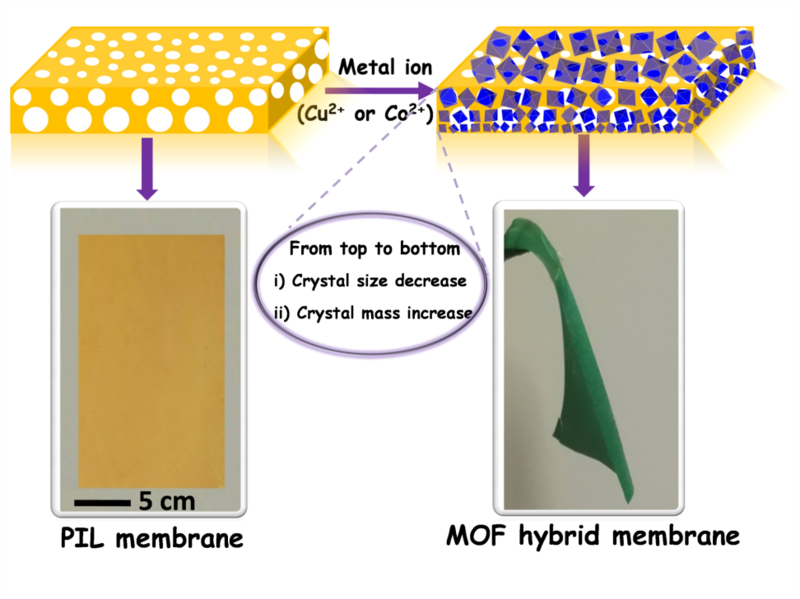 A manuscript has been accepted in Materials Horizons "A tale of two membranes: from poly(ionic liquid) to metal-organic framework hybrid nanoporous membranes via pseudomorphic replacement" by Jian-Ke Sun, Huijuan Lin, Weiyi Zhang, Min-Rui Gao, Markus Antonietti and Jiayin Yuan*. (Good job Jian-ke!) DOI:10.1039/C7MH00193B. Comment: Our nanoporous gradeint poly(ionic liquid) membranes have a new skill, i.e. to template ohter types of gradient membranes. As one example here, gradient metal-organic-framework membranes have been fabricated in one step by immersing the poly(ionic liquid) membranes into CuNO3 solution. The beautiful chemistry here is, Cu2+ will cut the ionic bonding the poly(ionic liquid) membrane, and simultaneously complex with the trimesic acid that is released in the previous step. It is a cascade reaction that helps preserve the nanoporous membrane morphology. The gradeint character of the orginal poly(ionic liquid) is replaced also in the MOF membrane, where a gradient in the crystal size and crystal mass distribution was identified. Elegant chemistry and decent materials processing in one step! -- May 17, 2017. 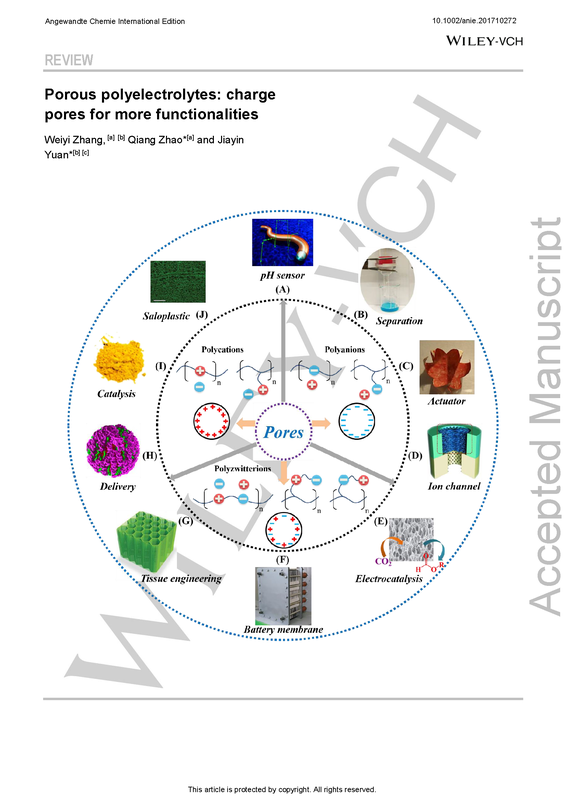 A manuscript has been accepted in Scientific Report "Synthesis of porous polymer/tissue paper hybrid membranes for switchable oil/water separation" by Cong-Xiao Cao, Jiayin Yuan*, Jin-pei Chen, Bao-Hang Han*. (Good job Congxiao and good luck with your new industry job!) Ms. No. SREP-17-13243A. 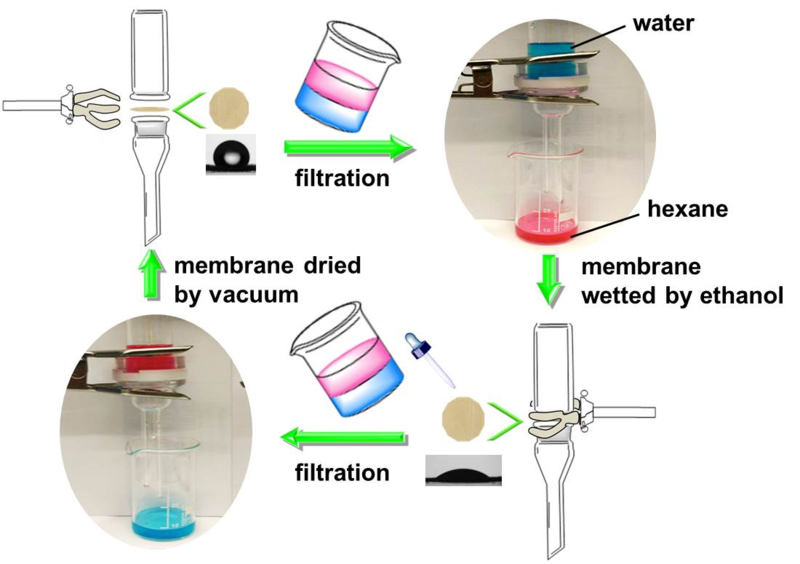 Comment: A normal filter paper was cobverted into solvent-responsive separation membrane by incorporting porous polymer networks into the interior microvoids. The synthetic procedure is super simple and easy to scael up. We do have a patent on the way to be filed. May this new discovery find real-life usage soon. -- May 11, 2017. A manuscript has been accepted in Angew. Chen Int. Ed. "Efficient Electrocatalytic Reduction of CO2 by Nitrogen-Doped Nanoporous Carbon/Carbon Nanotube Membranes - A Step Towards the Electrochemical CO2 Refinery" by Hong Wang, Jia Jia, Pengfei Song, Qiang Wang, Debao Li, Shixiong Min, Chenxi Qian, Lu Wang, Young Feng Li, Chun Ma, Tom Wu, Jiayin Yuan*, Markus Antonietti, Geoffrey A. Ozin. * (Good job Hong! and good luck with your new professorship soon!) DOI: 10.1002/anie.201703720. Comment: Besdie the high electrocatalytic reduction performance of CO2 into formate, the nanoporous carbon membranes are produced in the presence of carbon nanotubes. These carbon nanotubes template the formation of specific nitrogen species on their surface durig the carbonization process, which is favorable for the reduction reaction. Comment: The novelty of this manuscript lies in the design of carbon-carbon heterojunction by doping the outer surface of a microporous carbon fiber with nitrogen. The site-specific dopin gof nitrogen at a nano/microscale is a challenge task. The trick we used here is a typical polymer physics phenomena that a linear polymer chain will preferentially not enter into a cylindrical channel that has a diameter of less than 2 nm (the micropores) due to entropy reason. THis phenomena will deposite the PIL chains only on the outer surface of the microporous carbon fiber, which upon carbonization turned into a thin, nitrogen-rich, microporous skin on the fiber, to create a nanoscale carbon-(nitrogen-doped carbon) heterojunction. Such interface is highly polarized and charge carriers will flow across the interface till a new balance of chemical potential is reached. -- Mar. 1, 2017. The functional Polymer Group in Clarkson University starts with 3 members.